Selecting the proper air conditioning system for your space involves weighing several factors: the type of room, its total cubic footage, the number of people typically using the space, and the room’s exposure to sunlight. Portable and window air conditioners. These units are commonly used for cooling single rooms. Popular for their affordability, portability, and versatility, they enclose a compressor, condenser, expansion valve or coil, evaporator, and cooling coil in a single box, which then fits on a windowsill or in a hole cut into the wall. Central air conditioning systems. 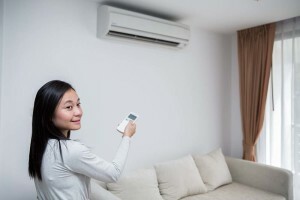 Efficient and effective for cooling entire homes, central AC typically includes a large, external condenser unit connected to an indoor air handling unit, which moves cool air in and warm air back out through a system of supply and return ducts. A drain pipe runs from the indoor unit to an outside gutter to carry away condensation. Ductless air conditioners. Also known as mini-split, multi-split, or split-ductless systems, these work well to cool one or two rooms. Multiroom systems are available as well. Like central AC, these units have an outdoor condenser and an indoor air handling unit. Rather than being linked by ductwork, however, the two units are connected by a conduit that houses the power cable, refrigerant tubing, suction tubing, and condensate drain. These systems eliminate the need to tear down walls and ceilings to run air ducts — a huge plus for older or architecturally sensitive homes. When selecting your unit, familiarize yourself with a few abbreviations that distinguish models on the market. First, air conditioners are rated by a seasonal energy efficiency ratio (SEER), which is the measurement of an air conditioner’s efficiency (the ratio of its cooling output to its energy input) over an entire cooling season. The British thermal unit (BTU) rating, another important figure, indicates cooling capacity — how quickly and effectively a unit can cool a given room. Most closely tied to your electric bill is the energy efficiency ratio (EER), which is the ratio of cooling capacity to electrical input — this figure tells you how efficiently an air conditioner operates. You can find the EER rating on each unit’s yellow Energy Guide label. A typical range runs from 8 to 11.5, with 10 or higher considered the most efficient. If energy efficiency is top of mind for you, consider a unit certified under the U.S. Energy Star program, which recognizes models with good SEER and EER ratings. An Energy Star-approved room air conditioner runs about 10 percent more efficiently than an older unit, while an Energy Star-approved central unit might be 15 percent more efficient than its standard counterpart. In addition to the energy savings a higher-rated product provides, your state and local municipalities may also offer rebates or other incentives to consumers for making an energy-smart choice. Once you’ve chose a unit, operating it efficiently will go a long way toward keeping your home cool and your utility bills low. via How to Choose an Air Conditioner | Zillow Blog.